HVAC design services, as the name signifies are used to Heat, Ventilate and air conditioning purposes. It is a technology of indoor and vehicular environmental comfort. HVAC system design is a sub category of Mechanical Engineering, based on the principle of thermodynamics, fluid mechanics, heat transferring mechanism etc. HVAC is a good design pattern of medium to large industrial buildings and offices such as skyscrapers and in marine environments such as aquariums, where safe and healthy building constructions are synchronized with respect to temperature and humidity, by making a way for fresh air from outdoors. HVAC design tools mainly include with some popular topics such as the Trane Ductulator, psychrometric charts, and load estimating forms. Ductulator is a handheld rotating calculator use the principle of equal friction design of sizing supply and return duct system. This includes friction loss per unit length, air velocity and volume, round and rectangular duct diameter. This system consists of one side English unit and one side metric unit. Psychrometric charts are of a standard altitude and different sizes. Cooling and heating load estimation sheets used for manual calculation of space cooling and heating loads. Duct is used in HVAC system to deliver and remove air. Normally duct can be made of galvanized mild steel. For installation purpose it is wrapped externally or lined with fiber glass blanket, known as the duct liner. 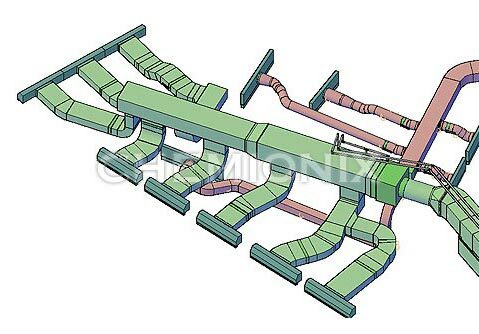 To implement the 3D ducting model, customers supply the required materials, such as HVAC schematic, the preferred position for installation of the system, preferred size, position of wall, floor, details of external physical layering if any etc. According to the airflow figures provided by the customers, companies select each of the details of duct shape and cross sectional area. Accordingly the components are made out to satiate the user’s requirement. Accessories are added to the ducts and pipes if required to generate a scale 3D model of completely fitted out HVAC room. This also generates 2D sectional installation drawing with annotations and dimensions for installers to use on site. The services have the ability to provide professionally design system for buildings, offices, retail sectors, supermarkets, food preparation areas as well as many other custom applications. They also provide a great comfort in winter and summer seasons and protects people’s home from outside pollutions as well. In this service sector of HVAC design services Chemionix plays a vital role. The engineers and developers always plan out innovative ways to better customer satisfaction based on any type of clients’ requirements wherein various types of services are catered to, HVAC being one. Before giving out any order to the organizations, people need to check the companies’ background and previous records pertaining to customers’ satisfaction. Chemionix is an exquisite provider of HVAC engineering based services to a myriad gamut of target clientele. to make sure that this switch is working in the correct manner. units will conduct smoothly all over out the year.